I just longed to go to school – to be clever like my brother, Joe, who had been there for two years and could read and write. So, I was told, if I was very good, I could go on my third birthday which I did, on March 11th, 1917. When the big day arrived, off I went, holding my brother’s hand. Sister Marie was my teacher, in the baby’s class. We sat in little wooden desks on an iron frame that had a fancy pattern – I was very intrigued by this and found that the little hole in the middle just fitted my shoe. All was well until I went to pull it out and it had stuck. I did the inevitable and cried. Sister Marie came to see what was the matter but couldn’t get it out. She fetched Miss Chrissie Horne, the Infant teacher who held me horizontal while Sister Marie pulled my foot out. My brother was so upset to think that I had made such a fuss on my first day but I certainly made my presence known!! So started my very happy days at St. Catharine’s. Each afternoon a rug was laid on the floor, and we each had our own little pillows and we laid down for a little sleep with a sheet of paper over our faces. My memory of being in Miss Chrissie Horne’s class, apart from our usual lessons, we were each taught to knit – I was given yellow and green wool to knit a doll’s dress. The two colours together made me feel sick – I am still very colour conscious!! Sister Josephine was our next teacher – she was always very kind to me and had the ability to pull out any of your ‘wobbly’ teeth!!! Then up to Standard 5, 6 and 7 to the famous Sister Ignatius!! Each new child was sat next to an older one – mine was Phyllis Gabb, now Mrs. Jack Baldwyn, and she is still my friend to this day. My only regret is that I passed the 11+ exam to go to the Grammar School, but I did not want to go and my parents did not make me. Sister Ignatius was very proud of me because I had the highest marks for arithmetic in the county that year. We had lovely Christmas parties each year. To make money for them, we wrote letters to various firms praising their goods, and in return they sent us parcels of their products. These were then labelled with raffle tickets and we had a shilling draw, everyone having a prize. We also had school outings to different places of interest – I think Weston-super-Mare was the favourite. We went by train and the traders in Campden took us by transport to the station. Every year we had a Rabbit Pie Supper. It cost half-a-crown to go in. 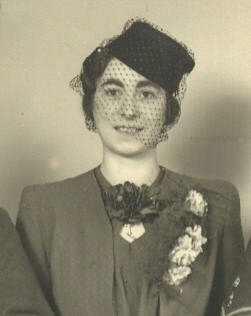 Various mothers made the pies, and trifles to follow – my mother’s table was always booked quickly – she was a good cook!! Local talent then gave a concert. I remember one year when Mr. Powell, a large gentleman, manager of Burton’s Stores, sang ‘Tiptoe Through the Tulips’ and I found the thought of him tiptoeing through anything was very amusing!! 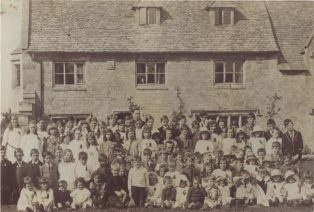 Another happy event at School was the party given by Mr. Watkinson for his birthday at Maidenwell, Broad Campden. After a lovely tea, we always had a firework display and our photographs taken. Father Bilsberrow was the Parish Priest when I was at school – I know we made a big fuss for his Silver Jubilee. Our School had a very good reputation – often we were known as the best in Gloucestershire. Sister Ignatius was a very good head mistress, and taught us wonderful embroidery. When we were in the top class, the girls went back at night to embroider altar cloths and make things to sell at school fetes. One other thing I remember, Mr. and Mrs. Sharpley lived at The Martins – he was an artist – they weren’t Catholics but applied to the School for someone to go to their house to embroider the layette for their first baby and nightdresses for the Mum-to-be. I was the one chosen, and went for several afternoons to sew, then had tea with the housekeeper, Miss Ashwin, who was a Catholic. The baby was a boy called Roger. 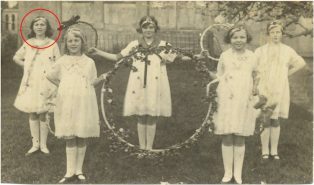 Girls from the Catholic School – The Hoop Dance. Dorothy Meadows circled. Each year we had a lovely concert in the Town Hall for three nights, always fully booked with villagers coming from all round. A scene from “The Merchant of Venice”. 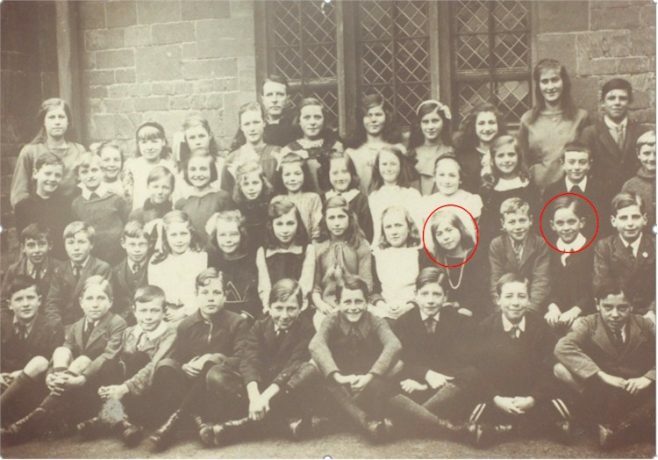 St Catharine’s School, 1923; Dorothy and Jack Blakeman circled. Another of my memories of school was a about a friend of mine, Jack Blakeman, who wasn’t very good at sums, as we called maths then, and was often kept in after school to do them. 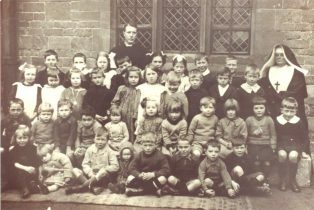 I used to wait outside and when the bell went in the convent for Sister Ignatius to have her tea, I went back into school to help Jack – I never got caught!! Often in the morning I found a little present in my desk. I still have a little blue enamel brooch shaped like a pansy – I often wondered if he pinched it from his sister, Kathy, who kept the little shop which is still called Blakemans House. When Jack left school he worked as a cabinet maker for Russells of Broadway, and was very skilled, so I think his measurements had improved!! The whole school which looked so big to us when we were at school, now, with all the new buildings, just looks like a small classroom. In our day it was heated by a big iron ‘tortoise’ stove with an iron fireguard round it. We had ‘nit’ nurses to come and inspect our hair, and health inspectors every so often. We always dreaded school inspectors who came without warning – ours was a Mr. Davies who always had a big dog with him, and the dog always came in to school. Also we had an attendance officer who would call to see why you were absent from school if you hadn’t sent a sick note – without warning, too!! We had a hand and shoe inspection as we lined up to go into school in the play-ground. What a wonderful surprise to read a little story about my husband’s Father, Jack Blakeman and to see him on the school photo.